This program has access to thousands of commands through a few buttons. First: Work in the Classic View to be compatible with class. If you lose a menu like the layers menu, go to any tool icon and right click. You will then have access to all of the menus available. Find the menu you want there, select it, and drag it to where you would like it to be. Second: Read each command line at the bottom of the screen. Many of the commands have multiple options. For example, when you select the "Draw Circle Command icon" the default after selecting the center point is "radius (diameter)". This means you need to enter the radius. If you want to enter the diameter, type either "D" or "diameter" and then you can enter the diameter. This has fooled many people, including me. Third: At the bottom of the screen you can see several options: Snap, Grid, Polar and Object Snap are the main ones. If you need to turn on Object Snap you can do it in mid command. If you need to change the settings, right click and go to settings. In most cases just choose all. In some cases you will only select the one you want. Note there are times when you want to temporarily turn object snap off. Remember, you can do that mid command. Just don't forget to turn it back on when you need it. 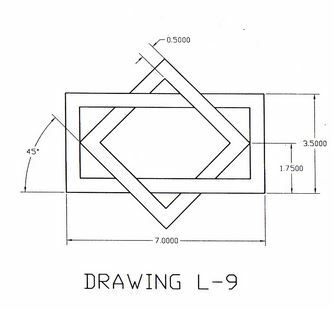 Layers needed: Floor 1(make floor layers .18 mm line weight), Floor 2, 1-Dim (make dimension layers .09 mm line weight), 2-Dim, 1-Text, 2-Text, 1-Hatch, 2-Hatch (make hatch layers .05 mm line weight). Limits: lower left 0,0; upper right 1200,900. 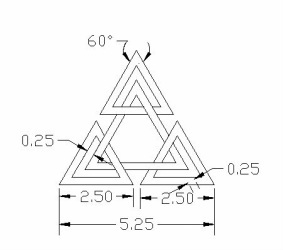 Modify Dimension: set units to architectural. Select upper left icon with star to create a new layer. Printing is called plotting. 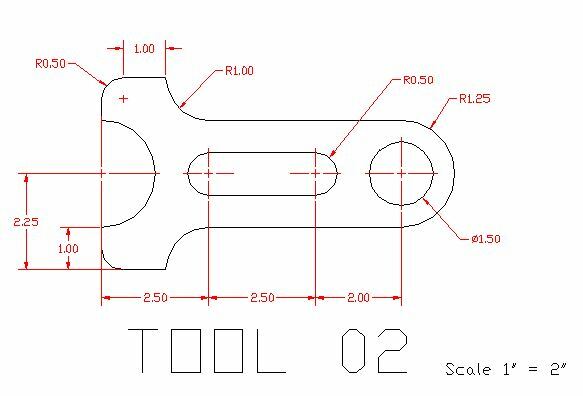 Auto Cad originally used colors to differentiate line weight. So if you try to just print without communicating the Auto Cad way, you will get a result very different from what you were hoping for. Step 1: Go to Plot and Under Page Setup choose Add to get a fresh Setup configuration. Select a printer (M401) and close. Step 2: Go to Page Setup Manager. Load in the Setup you just created and modify it. 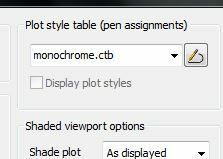 In the upper right corner for the Plot style table, select the pull down arrow and choose "monochrome.ctb" This will allow you to plot the line weights as they were setup in the layer manager when you started the project. Then close Page Setup Manager. Select Setup 1 or the named setup you just created. If your name is there and it looks black and white (not colored) plot. 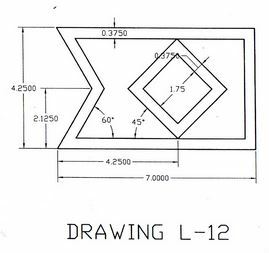 ﻿L- Tutorial:﻿ Draw objects on the Line layer and dimensions on the dimension layer. Dimension layer has .09 mm line weight. Title drawing with a text layer with .20 mm line weight. Plot using monochrome.ctb plot style. New commands are introduced progressively in the drawing sequence. Start on Draw layer. 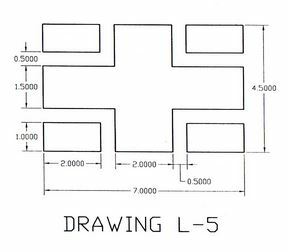 Select the line tool from the draw menu or type L and pick a point. Move the mouse to the right and enter the distance of the line you want to draw (5 minus 1.5 is 3.5). Hit enter after entering the distance and the line will appear on the screen. Then move the mouse straight up and enter the distance (2.5-1.75 which is .75). Keep going until you finish the shape. Use the ESC key to get out of the line command. Go to the dimension layer. Use the pull down dimension tab and use the first command which is linear to create the dimensions. Start on the Draw Layer. I would make a line 7 units long horizontally, then offset the line 4.5 units. 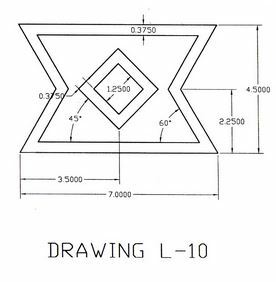 Then use polar settings to draw at 60 degrees to get the correct angles started and fillet the line segments with the fillet tool at 0 radius. Create the squares and rotate them to 45 degrees after you have centered them in the larger polygon. 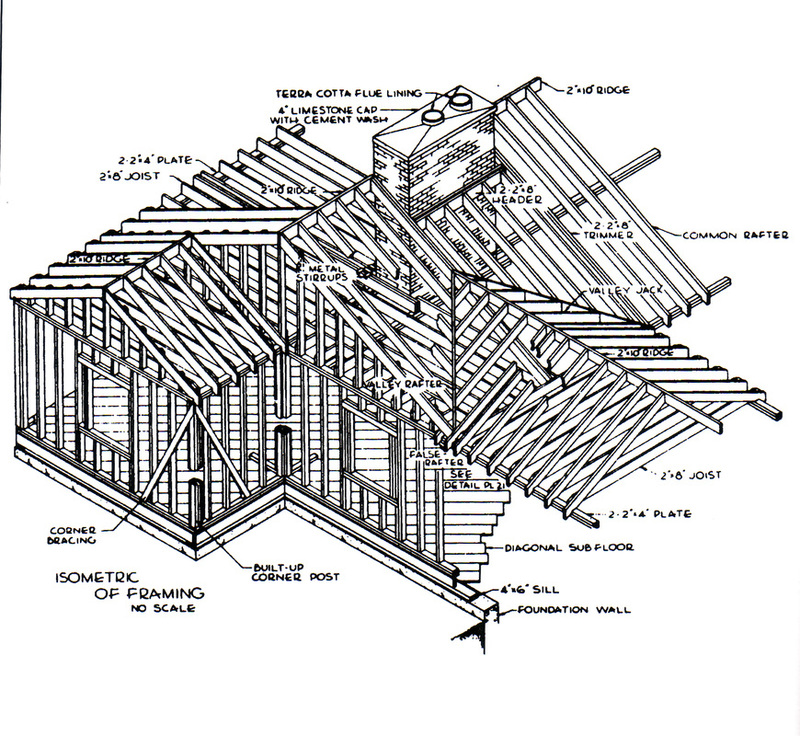 Dimensions require aligned and angular dimensions as per drawing. Start on the Draw layer. Create a rectangle using the rectangle tool. Pick a point, then move the mouse up and to the right. Enter @7,4.5 and hit enter. This makes the basic rectangle 7 units wide and 4.5 units high. Now use the explode tool, select the rectangle and hit enter to break the rectangle into 4 separate lines. Now use the offset tool or type offset. Hit enter, then type the value 2, then Enter. Now select one vertical line and click toward the center. Then select the other original vertical line and click toward the center. Hit enter to stop the command. Hit enter again to restart the command. Enter the value 1, hit enter. Select the bottom horizontal line and offset toward the center. Select the top horizontal line and offset toward the center. Hit enter to stop the command. Hit enter to restart the command. Type in the value .5 and hit enter. Then select the center vertical and horizontal lines and offset toward the center. Hit enter to stop the command. Now select the trim command and hit enter. This will cause any line you select to be trimmed by the intersecting lines on each side. Trim any line you want to trim. You may have to use erase on occasion to finish the drawing. Then use the dimension layer and dimension tool to create the required dimensions. This uses no new commands. Start on the Draw layer. Create the 7x3.5 rectangle like you did in L-5. Then use the offset tool to create the inner rectangle. Go to polar at the bottom of the screen. Make sure it is selected. Then right click and go to settings. Set the angle to 15 and click OK.
Make sure objects snaps are selected. Use the draw command. Start at the midpoint of the vertical. Extend the mouse the the right and up until the line wants to extend at 45 degrees. Make the line and escape. Start the other lines using this technique. Once you have all four lines you fillet them together. 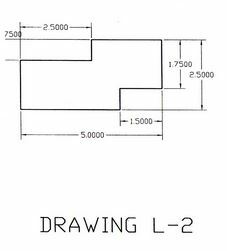 Select fillet with a zero radius and select the two lines you want to join together. Hit enter to make fillet ready to select the remaining two lines. Dimension. 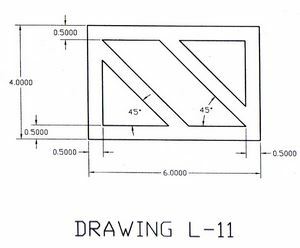 You will have to use Aligned and Angle to get the dimensions to work like in the original drawing. This uses no new commands. Draw based on what the drawing tells you, not what you assume. Triangles Drawing is based on using equilateral triangles. What do we know about equilateral triangles? (All sides are equal and all angles are equal). Also, if you are given a dimension for one space you can assume all spaces are the same. Also, go to the format tab and modify dimension units to display dimensions at two decimal places, not the default four decimal places. Hint: you can draw this with lines or polygon command. Rings Drawing has a hidden ring that is shown here faintly in red. That red ring has a diameter of 5 and allows you to use nodes. The center line marks were created by formatting dimensions to show center lines that way. 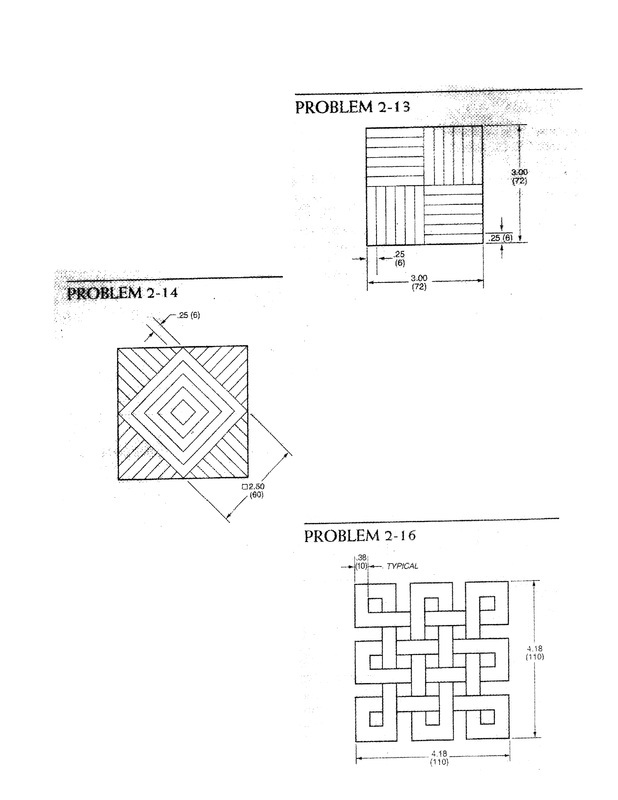 Maze is a traditional challenge. The most frequent mistake is using the wrong diameter. Second most frequent mistake is setting up far too many trim lines. Hint: not all offsets are created equal. 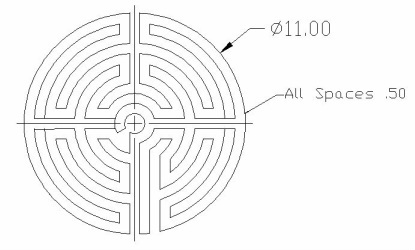 Proceed confidently but cautiously into the world of the maze. This problem is optional. If you do it you can get bonus credit. 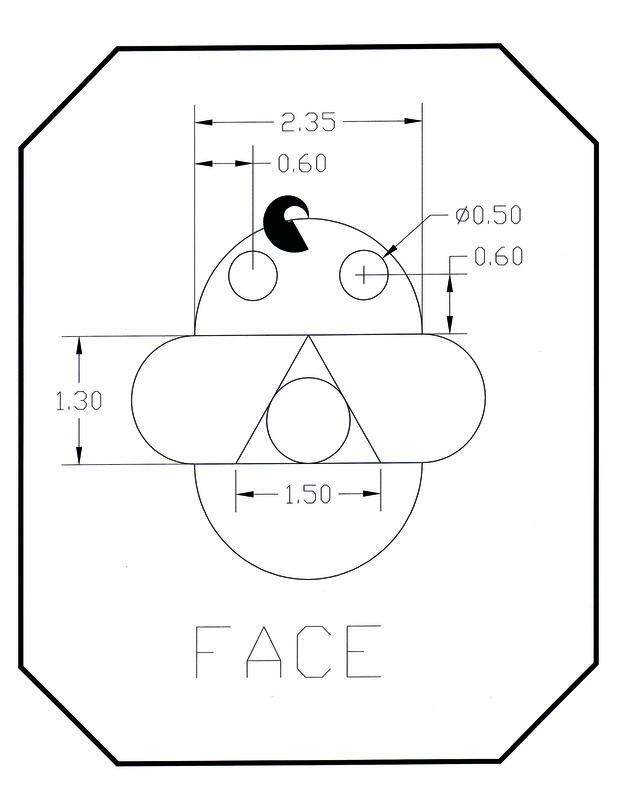 With the FACE drawing you will need to use the polyline command to make the curl. When you begin pline you are given options at the bottom of the page. One of the choices is "Width". You can control the starting width (in this case 0) and an ending width (in this case .5). You also have an "Arc" option. Play with that and soon you will be the polyline expert. Put the face in a frame. To do that you can begin with a rectangle or polygon. Then use pedit (polyline edit) to give the line a uniform width (like .25). Face is the next required drawing.